FBI assistant special agent in charge Ron Hopper (C), law enforcement and local community leaders speak during a press conference June 12, 2016 in Orlando, Florida. Photo: Gerardo Mora/Getty Images. The ISIS-affiliated news agency, Amaq News, claimed responsibility for a shooting rampage at a gay nightclub in Orlando that left 50 people dead overnight on Saturday. The agency said the shooting was the work of “a soldier of the caliphate,” multiple media outlets have reported. 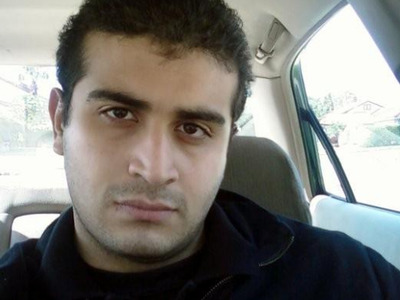 The suspected gunman, 29-year-old Omar Mateen, called 911 sometime Saturday night and pledged allegiance to ISIS, mentioning the Boston marathon bombers during the call. Florida Sen. Bill Nelson said Sunday in a press conference that Mateen, who was from Fort Pierce, Florida, had “some connection to ISIS,” and Rep. Adam Schiff — the ranking Democrat on the House Intelligence Committee — said Mateen had pledged allegiance to ISIS, according to information he had received from the Department of Homeland Security. Law enforcement confirmed that the incident is being treated as an act of terrorism. “The FBI first became aware of Mateen in 2013, when he made threats to coworkers, including possible ties to terrorist activities,” an FBI spokesman said in a press conference on Sunday. Mateen legally purchased the two firearms used in the attack on the nightclub — a handgun and a long gun — in the last few days, a police spokesman said in a press conference on Sunday. Mateen’s connection to ISIS does not necessarily mean he was in direct contact with the radical jihadists, or that the group directed him to carry out the attack. Nelson, the Florida senator, noted that the apparent connection to ISIS was not “official,” and US officials, speaking on the condition of anonymity, told Reuters they had yet to uncover direct contacts between the gunman and any extremist group. “There is a big difference between ISIS-directed and ISIS-inspired,” national-security analyst Juliette Kayyem said on CNN. Mir Seddique Mateen, Omar Mateen’s father, told NBC News that his son’s actions had “nothing to do with religion.” He noted that his son got angry when he saw two men kissing in Miami a couple of months ago and thinks that homophobia may have inspired his son to attack the nightclub. Seddique has his own YouTube channel where he has expressed his support for the Afghan Taliban, and recently declared his candicacy for the Afghan presidency. The YouTube videos come from a television show Seddique hosted called Durand Jirga on a channel called Payam-e-Afghan, which broadcasts from California, the Washington Post reported. JM Berger, an expert on the Islamic State and co-author of ISIS: State of Terror, largely agreed. “His pledge of allegiance to ISIS does not necessarily mean he was affiliated, although that may turn out to be the case. We’re still very early in the investigation,” Berger told Business Insider. “Calling 911 minutes before to pledge allegiance is like what happened in San Bernardino,” Mia Bloom, an ISIS expert and former fellow at the International Center for the Study of Terrorism at Penn State, told Business Insider. Tashfeen Malik — the female shooter in the San Bernardino attack that left 14 people dead — pledged allegiance to ISIS leader Abu Bakr al-Baghdadi on Facebook during the rampage. The overnight shooting at Pulse nightclub — a gay club in central Orlando — is the deadliest shooting in US history, with more fatalities than either the mass shooting at Virginia Tech in 2007 (32 dead) and the mass shooting at Sandy Hook Elementary School in Newtown, Connecticut in 2012 (27 dead). “He beat me. He would just come home and start beating me up because the laundry wasn’t finished or something like that,” she said. One of Mateen’s former coworkers described him as “unhinged and unstable,” and said he spoke of killing people often. Mateen reportedly had a 3-year-old son who he would take with him to the mosque. Mateen worked as a security guard in Fort Pierce and rented a car to drive to Orlando and carry out the attack, CNN’s Evan Perez reported. Mateen entered Pulse shortly before 2 a.m. after exhanging fire with an off-duty police officer working security at the club, police said in a press conference. He was armed with an AR-15 assault rifle and a handgun, according to law-enforcement officials’ description of the incident. TMZ has reported that Mateen had a state firearms licence. Mateen barricaded himself inside the nightclub and took hostages just after 2 a.m. and was negotiating with police when he gave them his name, according to CNN. A SWAT team entered the club about three hours later, after ensuring Mateen did not have a bomb, and shot the suspect. At least 53 people were wounded and have been transported to local hospitals. About 320 people were inside the nightclub at the time of the shooting, according to Orlando police. A state of emergency has been declared.